This holiday season has been quite a hectic, crazy one. Between my son’s knee surgeries and my general work schedule, I’ve barely had time to think. I still got out and cooked in my Dutch ovens, but I just haven’t been writing about it. I’ve got a backlog of recipes to catch up on! A few days before the big day, I started thawing the turkey. The best way to do that is to move it from the freezer to the fridge. We were having 30-40 degree days, so I just set it in the garage, still in its plastic packaging. The night before cooking, I set up the brine. This is going to be an overnight soak in a salt water solution to tenderize the meat and give it a bit of tang. I usually do this in a travel cooler. The best I’ve found is the large, round drink coolers. But use whatever you’ve got. I started by putting in about 2” of hot tap water in the bottom. To that, I added the salt and the sugar. I stirred this all up and got it as dissolved as I could. Then, I added a few more inches of cold water, stirring as I went. I unpacked the turkey and stuck a lot of holes in the skin all around with a paring knife. This helps the brine get more into the meat. I set it in the water (which actually looks really gross with the brown sugar in it), and then poured in enough water to cover the turkey. As a last bit, I usually add in some ice. I always do that in the summer so that it stays cool overnight. In the winter, I just let the cold of the night in the garage keep it the right temperature. By morning it was nicely brined and evenly thawed, ready for the fire. Since this was to be served in the early evening, I started preparing it at about 11:00. I first cubed up the potatoes into one inch blocks and tossed them around the bottom of the lightly oiled Dutch oven. The onions, too. You could add more veggies if you wanted, like celery and carrots. The point of the potatoes is to lift the turkey up above the juices that cook out. Then I went out and lit up a chimney full of coals. I set the turkey onto the potatoes and onions. Then I sprinkled some salt, pepper and paprika over the upper surface of the bird. After it was roasting, I thought it would be kinda tasty to have layered the top with honey. If you try that, let me know how it turns out. 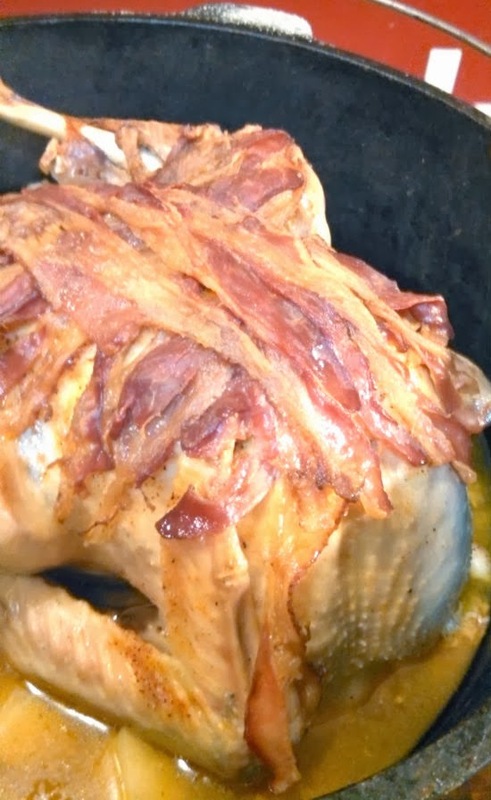 Finally, I simply draped the bacon strips over the top of the turkey. There were sufficient strips to layer them twice, once across the chest, and once on lengthwise. Once that was done, it was time to start roasting! I went out and set it on the coals. Typically, when roasting, you do the same number below and above, but I usually go a few more above, just because heat rises. And where it’s winter and there was a breeze to blow away some of the heat, I went with that. I wasn’t shooting for too hot of a roasting temp, about 350°F. Lower than that will just make for a slower roast, which tastes better anyway. At that point, it was just a matter of keeping the Dutch oven hot with fresh coals. Like I said, it was a bit breezy, so the coals burned a bit quicker. I like to do my turkeys to an internal temperature of between 170 and 180°F, just to make sure that it’s done all the way through. The seasonings and the bacon combined to a nice flavor with supplemented the turkey without overpowering it. It was a great centerpiece for the Christmas meal!